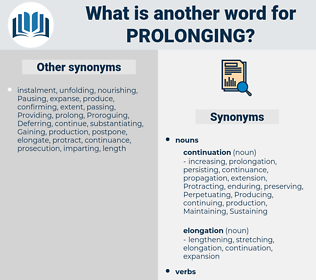 What is another word for Prolonging? Procrastinating, lingering, Perpetuating, renewing, Postponing, expanding, Suspending, persisting, continuing, Delaying, Producing, Deferring, withholding, Maintaining, retaining, Granting, stretching, dragging, stalling, supplying, lasting, keeping. stop, termination, finish, end, cessation, halt. laziness, idleness, lethargy, apathy, indolence. hasten, hurry, forge, expedite, advance, forward. lessen, constrict, reduce, compress, contract. No medicine is so effective in prolonging the intervals between attacks as this placing of the patient in favorable conditions of mind and body. His slight, graceful form, the look of intellectual strength upon his pale face, his modest bearing, his humorous smile won sympathy even from those who were impatient at the prolonging of the meeting. purulence, purulency, prelims, parlance, paralanguage, prolonge.